Summary: On a swimming scholarship to a prestigious private school, Bram is doing everything he can to make the Sharks’ swim team. This means participating in hazing rituals invented by the senior members of the team, putting himself and others at risk. When Jeremy, a fellow Shark, comes to Bram with a previous hazing cover-up, Bram is driven to investigate, especially after Jeremy is a victim of what looks like a hit and run accident. Aided by Jeremy’s sister, Abby, Bram is in a race against time to figure out who is really behind the death of a promising former team mate before he ends up as their next victim. Review: It took me an hour and 13 minutes to read Haze by Erin Thomas because I couldn’t put it down. Usually I take a reading break every twenty minutes, but I was so engaged by Thomas’ story that I just kept reading. In only 175 pages Thomas was able to make me care about her characters, develop suspense around who the culprit of the hazing gone wrong was and create believable friendships between Bram and his teammates. Not an easy thing to do. I know Bram was a great guy and I agree with Thomas’ that he has a wonderful name, but my favourite character was definitely Droid. The nickname, the hair, the Star Wars connection, the swim cap and the streaking? All epic. Mostly though, I just enjoyed that Thomas told a good story. It was a sports book with a murder mystery of sorts and I was hooked. 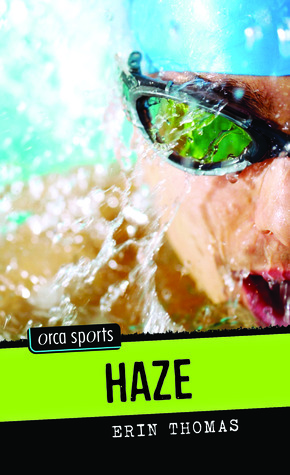 Haze is an excellent reluctant reader pick for early to mid male teens. 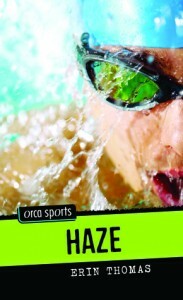 Haze by Erin Thomas is published by Orca Book Publishers, (2012).